In the 37 years since the CN Tower opened to the public, only two times has someone actually jumped off the top of it. Both times, it has been the same man - maverick daredevil Dar Robinson. 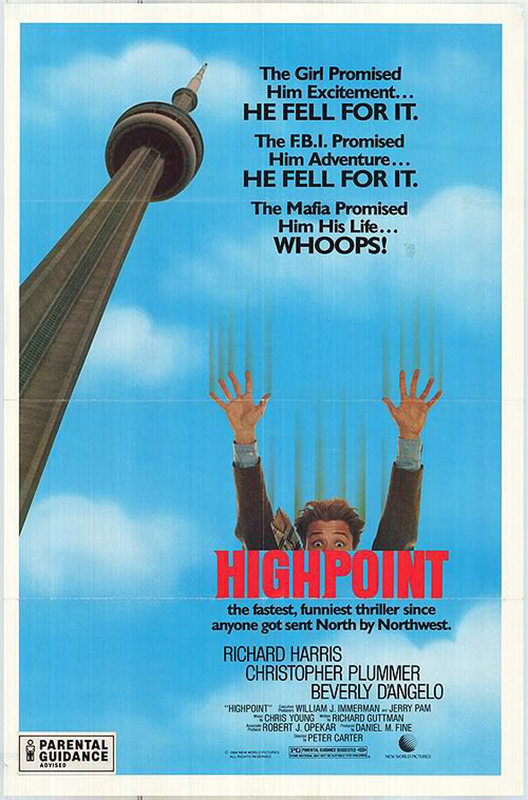 The steel-balled stuntman was paid a cool $150,000 to double for Christopher Plummer and jump off the Tower for the exciting conclusion to a 1982 (but filmed in 1979) heist gone awry rom-com Highpoint, itself a high point in a middling, convoluted Canuxploitation snoozer. Academy award winner Plummer was really slumming it here as James Hatcher, a sleazy conman who embezzles millions from a joint CIA/Mafia sting operation. Original Dumbledore Richard Harris and throaty pre-Vacation Beverly D'Angelo give chase, as well as bumbling assassins played by customary Cancon haunts Saul Rubinek and Maury Chaykin, who also scheme to claim the money for themselves. After a series of increasingly slapstick encounters, all the players meet at the CN Tower for the film's climax. Hilariously (in light of his mammoth contribution) credited as only the 2ND stunt performer, Dar Robinson's amazing Highpoint stunt in 1979 earned him instant untouchable world-wide cred, as previously only one other person had dared jump the 1,170-ft high tower, and that fellow did it when the structure was only half constructed. Dar had cut his stunt teeth on glossy big budget disaster movies like The Towering Inferno and Concord: Airport '79, but his fearless parachute jump in Highpoint signalled a bold new upping of the ante - a 700 foot free-fall relying on a concealed parachute to be opened at precisely the last possible moment. The following year, Dar dutifully dropped 220 feet out of a Hyatt Regency Downtown in Atlanta for the tough neo-noir Sharky's Machine, directed by his good friend Burt Reynolds: "In terms of sheer courage" noted Reynolds, "Dar had no peer." With no parachute or harness, Dar instead relied on an inflatable mattress to break his fall, setting the record for highest wireless free-fall jump in a film (he went on to claim over 20 stunt records). Reynolds was so impressed he gave Dar a villainous on-screen role as psycho albino killer Moke in his 1985 adaptation of Elmore Leonard's Stick. Around the same time, weekly TV series That's Incredible! was pushing the boundaries of human endeavour in the name of entertainment, usually featuring breathtaking stunts: "Don't try this at home" was the show's popular catch phrase. Hosted by the perfectly chiseled John Davidson, NFL legend Fran Tarkenton and sultry blonde Cathy Lee Crosby, That's Incredible! perhaps laid the ground for our YouTube era fascination with short clips of people doing cool stunts, hurting themselves, or very nearly killing themselves. Dar saw That's Incredible! as a great forum for yet another next level stunt, revisiting Toronto and taking the tower again. However this time Dar wanted to try something different, so there would be no parachute. Dar and his team instead constructed a single 1/8" (3mm) wire attached to a breaking system controlled by his best friend and assistant "Rocketman" Ky Michaelson, which would be pulled at the very last moment, stopping only a short distance from the ground. No stranger to mixing precise mathematical projections with meticulous planning and devil-may-care brassiness, Dar remained an unshakeable force of nature. However, with no Hollywood film crew a la Highpoint (which ironically had not even been released theatrically when Dar returned to leap from the Tower again), things were slightly more diy. After visiting the Tower, Ky quickly became concerned: "I saw that the base of the building actually flared out towards the bottom. This caused a vortex or a tornado effect with swirling very unstable winds. We set up some equipment to measure what the wind was doing at different levels. We found out that the winds were doing different things at every level up the tower." The night before the jump, Dar declined a steak dinner and drinks with host Cathy Lee Crosby. "This was not like Dar at all" recalls Ky. Was the world's greatest stuntman in danger of losing his bottle? While incredibly everything panned out, disaster was moments away. Not long after disconnecting Dar, the wind snapped the cable off the top of the Tower, chipping pieces of concrete off as it hurtled towards the ground. Questions of safety were raised at City Hall and Queen's Park, and while there was no outright banning of such stunts, here we are 30 plus years later and none have materialized. Finding someone to insure such foolhardiness may play a part, but that certainly didn't stop Super Dave Osborne from trying in the mid-1980s, natch. Dar Robinson went on to perform more outrageous stunts in classic B-movies like Police Academy (also filmed in Toronto), Turk 182, To Live and Die in LA, and Vamp. Just as he had scored A-list cred with the amazing stunt work in Richard Donner's original Lethal Weapon (1987), Dar was killed in a motorcycle accident while shooting a forgettable thriller entitled Million Dollar Mystery. The movie was dedicated to him (as was Lethal Weapon), a Hollywood first, and as well he won a posthumous 1995 Academy Award for his innovations in the world of stunt work. Sadly, not many people in Toronto know about Dar Robinson. 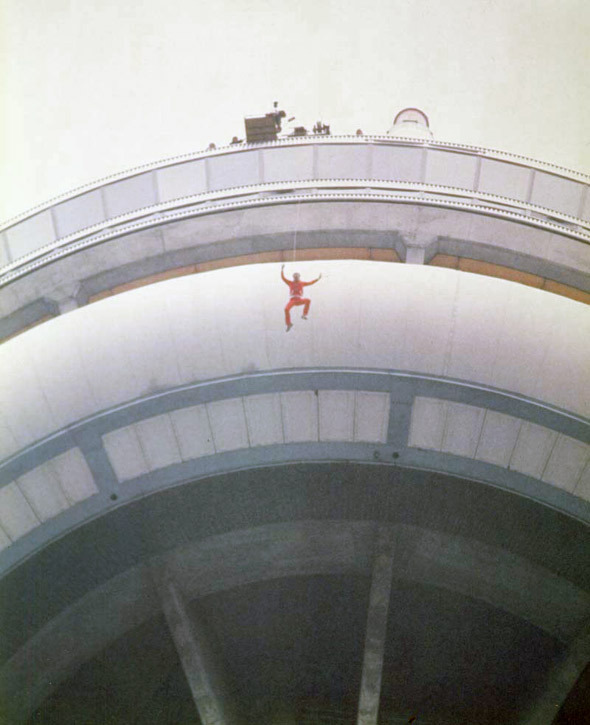 Now that Edgewalk has popularized thrill seeking atop the CN Tower, it would be nice to think that Dar's amazing stunts for both Highpoint and That's Incredible! warrant a little more than internet curio. Perhaps a bronzed statue would be appropriate, seated on the edge of the rooftop, glaring down at the impossible heights and giving a thumbs up to fellow edgewalkers everywhere? Note: The That's Incredible! clips presented here are from a 1987 TV special entitled The Ultimate Stuntman: A Tribute to Dar Robinson hosted by Chuck Norris, which repackaged much of the That's Incredible! footage, however not all of it. Chuck's grizzled delivery (cf "Toronto, Canada") more than makes up for any errant footage, however.